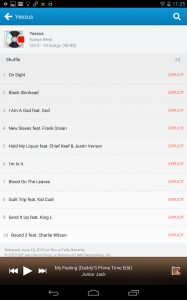 Home » News Android » Is Rdio Music App worth? Is Rdio Music App worth? Since Google is yet to release its music subscription service to users in Canada yet and Microsoft is still dragging its feet with the Xbox Music app for Android and iOS, I’ve had to check out some other services, while i wait for the two tech giants to release their offerings out here. One subscription service that recently caught my eye when I was browsing through my Facebook feed was Rdio. The newsfeed ad looked enticing enough and I had my doubts about whether a small company could beat offerings from Microsoft and Google but nevertheless I decided to give it a try. The app looks outstanding when being viewed on an iOS device such as an iPad. It could almost make you want to use it just because of the outstanding colors. You can sign in with your Facebook account which is what I did and they give you a 14 day trial which I took advantage of in this case. There is quite a social aspect to this app as you can follow your friends and also firms like MTV to see what they are listening to and what’s hot right now. One thing that really irks me about some of these music subscription apps is that once you sync or download songs on to your PC or your mobile phone, you can’t then play it outside the app. This is even more frustrating on Rdio as it takes a long time to find what you actually saved in the first place. Also the app is not as quick as it could be, perhaps that could be due to my internet connection but its still frustrating nonetheless. They certainly have some work to do when it comes to navigation if they really want to compete on a level with Microsoft and Google. Right off the bat however you can quickly see some of the glaring flaws in this app. I only followed MTV News once I got inside the app because I didn’t want to be forced to listen to my friends’ bad taste in music. Once I got to the heavy rotation screen I was somewhat ambivalent towards it. On one hand I could some stuff that I did like but on the other I found it quite hard to navigate the app to find what I really wanted to listen to. This became extremely frustrating after a while and it took some time for me to find what I wanted to listen to. Rdio is really keen to have people discover new music while listening to stuff on their devices. Once a song you are playing is finished the app starts playing a different song probably based on the last song you were playing. This can be a good or bad thing depending on the song that comes up next of course. Although I’ve only been using the app for a short period of time I don’t think that it has quite as wide a selection of songs as Microsoft’s Xbox Music offering. I know that Canada usually has a narrower selection than the United States but I’ve used Xbox Music before and recall a lot less frustration whilst looking for songs. One really positive spin on this app is the subscription pricing model. It’s really flexible as you can get a plan for as low as $4.99 a month to play music on your computer only. You can also get a discount for getting more users on a family plan. That makes it somewhat more attractive that the other price models being offered by Google and Microsoft. All in all Rdio was a good experience. Visually it looks amazing but I am not sure whether I will continue with it or not but I think that when Xbox Music or Google All Music Access is released in Canada I will be dropping Rdio then. What is your favorite music streaming service? Please tell us by leaving a comment below.